Microsoft's Windows Insiders program has crossed the 10 million members mark recently according to a blog post by Microsoft executive Yusuf Mehdi. Introduced back in October 2014 when the first preview build of Windows 10 was released to the public, membership grew quickly to over a million over the course of a couple of weeks. We have had one of these unbelievable experiences with our Windows 10 Insider program. We count over 10M Windows Insiders today, many of them fans, who test and use the latest build of Windows 10 on a daily basis. Their feedback comes fast and furious, they have a relentless bar of what they expect, but it so inspires our team and drives our very focus on a daily basis. The Windows Insider program started out as a way for Windows enthusiasts (and professionals), to run development versions of the Windows 10 operating system. For members, it meant that they could explore new versions of the operating system before release, for instance to check out new features and capabilities, or make sure that compatibility was not an issue. For Microsoft, it means a treasure trove of telemetry data. The company runs its own tests on Windows 10 builds, but even a fairly large organization like Microsoft cannot test all device configurations that float around these days. Pushing builds out to -- now -- over 10 million members gives Microsoft better data. That's probably the main reason why the company introduced the Windows Insider program. Users may report issues to Microsoft, and give feedback on certain things. 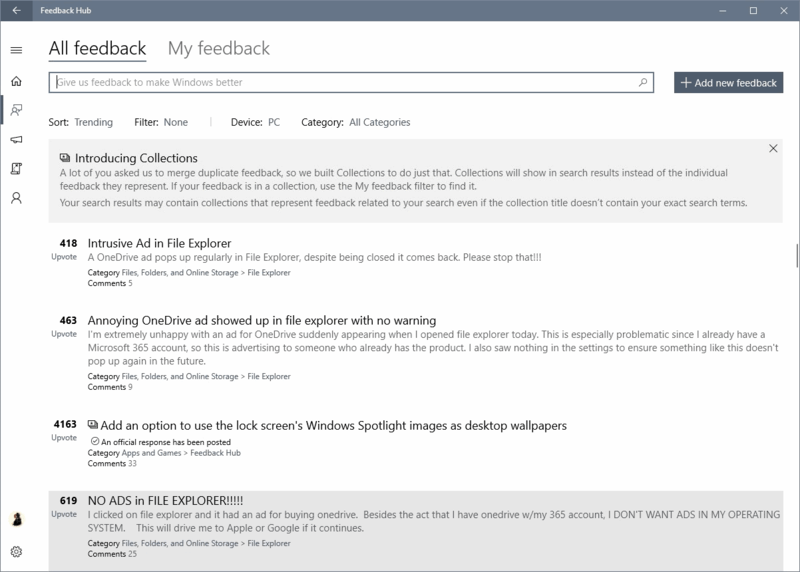 The Feedback Hub, a Windows 10 application that is delivered with Insider Builds, is the main way to do so. Microsoft monitors user input, but there is no guarantee that the company will act on it. We love to see the Insider feedback pouring in. Seeing all your input creates a great energy across the Windows team. We sort through it, figure out what is already known and what is new, and then reshape our product backlogs based on what we learn. In one of our team rooms, we put up a large screen that cycles through incoming feedback. It shows the incoming feedback rate, and highlights trending feedback. Our team gathers around it during our daily meeting. We talk about features we’re building in the Windows Feedback app, and what we’re doing to help all of the feature teams in OSG identify top feedback requests in their areas. Things still go wrong, even with 10 million beta testers as the past couple of months have shown. The program has evolved ever since it was introduced. Microsoft started to develop it, and evolved it into a community of like minded individuals. The company revealed the Windows Insider Program for IT Professionals recently which will be launched soon. A registration form is already available on the linked website above. Microsoft plans to offer new software tools, and a community "to serve IT professionals around the world" with the new program. The Insider Program is a success for Microsoft, there is no doubt about that. The company gains valuable telemetry data and user feedback thanks to the -- now -- more than 10 million beta testers in the Fast, Slow and Preview release channels of the program. Now You: What's your take on the Windows Insider program? One could argue everyone who uses windows 10 is a beta tester/quality tester. martin can u tell me that windows 10 beta is free of cost or not ? I think you need a valid license now. As alpha-testers, Win 10 Insiders have free use of the Win 10 Test-builds, eg Build 15063. They only need to register for the Insider Program. Each Test-build has an EOL of about 6 months = need to upgrade to a new Test-build before EOL is reached. Insiders should not run the Test-builds on their main PC. Even if you’re not on the Insider program, Windows 10 feels like it’s in perpetual beta. What a business or workplace needs most is stability and consistency, and with Win10 your situation constantly hangs by a thread that can be severed by a single rogue update that you have little to no power to stop. This is the biggest deal breaker in a long, long list of objectionable changes that came with Windows 10. Seeing as how this seems to be the future of Microsoft Windows, the last versions of Windows I’ll be using are Windows 7 and Windows Server 2012 R2. I feel a very similar situation happened with the direction of OSX (macOS). I have a great distaste for OSX versions after Mountain Lion, so when I find myself using OSX I always prefer 10.8.5, and even then it’s only because it has much broader compatibility than what will always be my favorite OSX version, Snow Leopard (10.6.8). And if I can no longer rely on Windows as my primary OS, then it’s Manjaro all the way. By far my favorite nix distro. Just out of curiosity, what desktop environment do you prefer for Manjaro? As a Linux beginner, I found Xfce to be too limited in GUI functionality, and as someone who’s testing distros in virtual machines on a seven- or eight-year-old laptop, I’m finding KDE to be intolerably laggy. I haven’t tried Gnome or any of the community builds. I’ve tested Gnome, Cinnamon, and KDE. I use Kubuntu and Linux Mint(KDE) on my parents computers and they can adapt to it because it resembles Windows GUI the most. I don’t know about the new KDE but the current KDE I use can run without lag in pentium 3 with around 1gb ram, I never update because those computers don’t have internet. Thanks. For whatever reason, the current version of Manjaro KDE is the least responsive distro I’ve tried, in a virtual machine with 2 of my Core i5’s 4 virtual cores, 2GB of 8GB RAM, 64 of 128 MB graphics memory, and 3D acceleration. (I’m wondering whether there’s an issue with the guest extensions that is causing it to run in software rendering mode. If so, I’m not getting a warning pop-up like the ones I’ve had in Linux Mint a couple of times in the past.) Even Chapeau Linux 24 with Gnome 3.2, which is supposedly a resource hog, is snappier. Overall, I’ve had the best experience (albeit not a perfect one) with Linux Mint Cinnamon (17.3, 18, and 18.1). But that may just be because I’ve had the fewest VirtualBox problems with it. I’m also a Linux beginner and I found the XFCE desktop that came with Manjaro to be very nice, but about a year ago I stumbled upon Manjaro LXQt and that’s the desktop environment I’ve been using since. I found the fact that I could tweak the interface to closely resemble the Windows UI to be very amusing, but what appealed to me most was how lightweight and responsive LXQt was even compared to XFCE. I run it on a customized Thinkpad T61p from 2007 with a Core 2 Duo T7500 CPU and 4 GB of RAM (which I plan to upgrade to a T9500 CPU and 8 GB of RAM in the near future) and the performance was no worse than the performance of Windows 7 (which I would describe as “snappy”) running on a 256 GB SSD but YMMV. This is all running on direct hardware. I’ve had no luck getting good performance out of virtualized environments on hardware as old as mine. Even running virtual Android Jellybean via AMIDuOS the performance is just barely passable, with Lollipop being unusably slow. After customization, I do not find the LXQt UI to be limited at least when compared to Windows 7 which I use as my primary OS, but again my needs are not too advanced. My most important necessities are being able to work with folders and files on the desktop, taskbar application switching, and pinning programs to the taskbar. The file manager is comparable to Windows Explorer and that’s good enough for me. What truly keeps me from using Manjaro as my primary OS are certain tools essential to my workflow, like Voidtools Everything Search, and AutoHotKey. I also really like rendering videos with madVR and I have yet to find a better download manager than IDM which I use constantly, particularly the integrated video stream downloader. Not to mention the best playlist manager ever, foobar2000. Who can argue with 10 million unpaid testers, although judging by the state of Windows 10 it seems quantity doesn’t equal quality. Sounds like being a TechNet subscriber 20 years ago, which I was. Of course, that wasn’t just about Windows. So, do the “insiders” make up the bulk of those who actually use Win10 for something? or the opposite? The last figure that Microsoft revealed was 400 million active devices (or was it users, cannot remember) six months ago. The added three million “Insiders” are very likely X-Box insiders. The X-Box insider program was rolled into the Windows Insider program. So, there is only one number to show now. Microsoft implies that millions suddenly decided to jump into the deep end. Nope. There is no way three million people just joined the Insider program out of the blue. July 29th, 2016. That’ll be 20 (twenty) months since Windows 10 was first officially released. And it is still being tested, which is the least considering it’s not yet reliable. Maybe is Microsoft aiming to figure in The Guinness Book of Records as the longest beta staged OS? That, at least, is fulfilled. On another hand managing an advertisement and tracking dedicated platform to deliver nevertheless OS features is a tough challenge which should be taken into consideration before bashing the company as we too often do. Windows 10 itself is in a perpetual beta phase, microsoft admitted themselves with the exclusion of UWP (good riddance, piece of junk!) from LTSB and Server 2016. Can we believe in what M$ say.? Can the 10 million figure be independently verified.? For all we know, the number of Win 10 Insiders may actually be < 2 million = M$ are trumpeting the 10 million figure to trick people into joining the "10 million" herd and become Win 10 Insiders(= herd mentality or hype). The number of Insiders may actually have dwindled because the novelty of playing around with a new OS has long ago worn off since the release of Win 10 RTM on 29 July 2015, ie why play with a Win 10 Insider Test-build when you can have the real thing.? ……. My hypothesis may be true because M$ have been dishing out buggy updates to Win 10 users since Day 1. In comparison, there were way less buggy updates for Win XP/Vista/7/8.1. Actually, Win 10 Insiders are alpha-testers, and not beta-testers, because M$ have laid off most of their in-house alpha-testers or their employees in the Quality Assurance Department a few years ago = save costs = more bonus for CEO Nadella. ……. It is Win 10 Home users who are beta-testers. Maybe, the number of Win 10 Home beta-testers have also dwindled. Seems, it is 10 million REGISTERED Win 10 Insiders. Bet a few million are no longer running Win 10 Test-builds. Remember the vitriolic comments hurled at Win 7 and Win 8.1 Neanderthals, At least until the new builds / updates started borking PCs / Laptops, then they all went quiet. TJ, I have no problems with Windows 10, I use is every single day with very few issues. I use it for banking, music, news, taxes, photos, all kinds of things. As far as I’m concerned, it’s a good OS. I’ve used very few other operating systems, but they all seem to be problematic at times. People like to complain, that’s all I read on comment sections like this. You can call me a fan boy. * The “Ask me anything” bar yields more useful results than Windows 7’s “Search programs and files” bar does. It’s an improvement. * There are ads in the Start menu. * There are ads in the lockout screen. * The Windows 10 machine syncs files with two other computers on his home network and I’ve set up 16 different RealTimeSync tasks for that purpose. In Windows 7, I can make these tasks autostart at log-on by simply copying and pasting shortcuts to them in a Startup folder (all users or current user). In Windows 10, with User Account Control on, you have to manually confirm each of the 16 tasks at log-on, which my dad would find intolerable. With User Account Control turned off, not only do they not run, you don’t get any warning that they haven’t run. Instead of using Startup-folder shortcuts, I had to add 16 scheduled tasks in Task Scheduler, which took nearly two hours. (And that was only because I exported representative tasks as XML files, manually edited them, and re-imported them as different tasks. If I had created all of the tasks from scratch in Task Scheduler, it would have taken longer.) Bottom line: what would have taken me less than a minute in Windows 7 took me two hours in Windows 10. * I still can’t scan documents from his HP multifunction printer directly to a folder on his Windows 10 computer when initiating the scan from the printer. With his Windows 7 computers, no problem. With the Windows 10 computer, Windows apparently thinks it must protect his scans folder from a hostile intrusion from a shared homegroup printer. I’m not the only one to have run into this problem, and no one seems to have found a solution for it. * The computer support people at my dad’s work seem to have turned off Windows Update, which is a relief, given all the stories one reads. I use WSUS Offline Update to periodically install security updates only. * This is a subjective opinion, but I think that while “modern” flat GUIs might have a place on small smartphone screens, “3D” GUIs make it considerably easier to distinguish windows, control buttons, and other graphical elements on larger screens. Windows 10’s GUI is flat. In conclusion … the “Ask me anything” bar is pretty nice. Like-minded, fanboys and enthusiasts do not result in a quality product. Windows 8 and Vista had a beta testing program. It was not the Insiders program that W10 has, but it was set up under CEIP. There were 15 million users participating in the W7 beta testing program under CEIP., but it was not about improving the product and identifying bugs, it was about telemetry. The Trojan horse has been Microsoft’s preferred method of dealing with users and it has fooled millions. Now tens of millions.